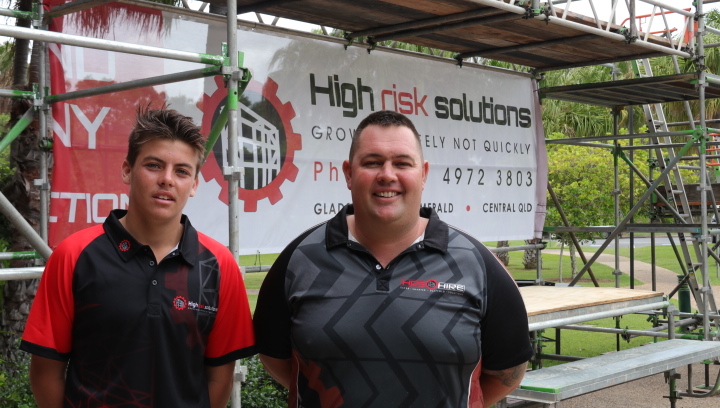 Encouraging young people to pursue a career as a scaffolder was the inspiration behind High Risk Solutions Pty Ltd Scaffold Open Day held on January 11th and 12th. Managing Director of High Risk Solutions, David Nunn said the open day was a great way for people to learn if they have what it takes to get a job in the scaffolding industry. Mr Nunn said the scope of work for shutdowns in the Region for the future looks to be expanding so it is important that Gladstone establishes the workforce to support these jobs. This will encourage businesses to use local scaffold professionals instead of fly in fly out workers. The open day provided an opportunity for people who may be interested in a career in scaffolding to learn about how they can train to gain the necessary qualifications to secure a job. Attendees had the opportunity to speak to people who have made a lifestyle out of working in the industry and the benefits of establishing a career in the scaffolding can bring. Mr Nunn said the open days were very successful and that High Risk Solutions were also preparing to give away two scaffolding traineeships to the right candidates.